1Department of Physical Medicine and Rehabilitation, Recep Tayyip Erdogan University Medical School, 53100 Rize, Turkey. 2Department of Infectious Diseases, Recep Tayyip Erdogan University Medical School, 53100 Rize, Turkey. 3Clinic of Dermatology, Fatih State Hospital, 61000 Trabzon, Turkey. *Address correspondence and reprints request to: Aysegul Kucukali Turkyilmaz, Department of Physical Medicine and Rehabilitation, Recep Tayyip Erdogan University Medical School, 53100 Rize, Turkey. Turkyilmaz AK, Devrimsel G, Topaloglu MS, Erturk A, Capkin AA, Yildirim M. Atypical Skin Rash in a Patient with Adult-Onset Still's Disease: A Case Report. Oman Med J 2013 Jul; 28(4). Adult-onset Still's disease (AOSD) is an uncommon idiopathic disorder with various clinical manifestations. The absence of specific serological and pathological findings often makes the disease difficult to diagnose. The presence of skin lesions is important to the correct diagnosis of the disease. Various atypical skin lesions have been reported in association with Adult-onset Still's disease. We present a 52-year-old male who had atypical cutaneous manifestations of Adult-onset Still's disease. The rash manifested as persistent, pruritic, dark reddish, confluent, erythematous maculopapules and plaques on his chest, abdomen, upper back and proximal extremities. He suffered high, spiking fevers and had marked elevations of ferritin, C-reactive protein, and the erythrocyte sedimentation rate, which are characteristic of Adult-onset Still's disease. The fever and systemic symptoms improved after the administration of intravenous pulse methylprednisolone therapy. The skin lesions improved after prednisolone and methotrexate combination therapy. Therefore, to make the correct diagnosis, it is important to understand that patients with Adult-onset Still's disease may present with various types of skin lesions. 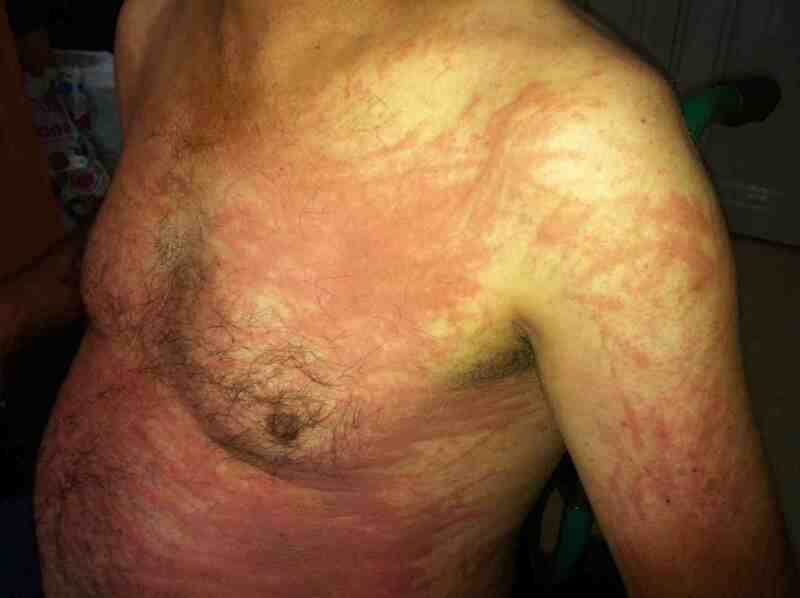 Keywords: Adult-onset Still's disease; Skin rash; Pruritic papular eruption. We report of a patient with a persistent pruritic rash characterized by erythematous maculopapules and plaques as initial manifestations of AOSD. A 52-year-old Turkish man presented with a two-week history of a high, spiking fever, sore throat, shortness of breath, cough, and a persistent pruritic skin rash on his chest, back, abdomen and arms in July 2012. He had no significant medical history, was not taking any medication, and had no significant family history. His vital signs at admission were a temperature of 39.2°C, a heart rate of 78 beats per minute, a respiratory rate of 16 breaths per minute, and a blood pressure of 124/82 mmHg. A physical examination revealed dark-reddish, confluent, pruritic erythematous maculopapules and plaques on his trunk, abdomen, upper back and proximal extremities accompanied by a linear configuration caused by vigorous scratching (Fig. 1). A respiratory evaluation showed absent breath sounds at the base of the lungs, and an abdominal examination showed mild hepatosplenomegaly. The superficial lymph nodes were not palpable. The patient had polyarthralgia of his wrists, knees and ankles, but had no active synovitis. Figure 1: Persistent erythematous maculopapules and plaques with linear configuration on the trunk and proximal extremity. The systemic examination was otherwise unremarkable. Peripheral blood tests showed leukocytosis of 12,800/uL with 88% neutrophils. His C-reactive protein (CRP) was 26 mg/L, and his erythrocyte sedimentation rate (ESR) was 93 mm/h. Urinalysis and cultures of urine, a pharynx swab, and 3 blood samples were negative. His bone profile, renal function, immunoglobulins, and protein electrophoresis were normal. Table 1 shows the patient’s laboratory results. A chest radiograph showed bilateral lower lobe consolidation with minimal pleural effusion. Based on the clinical features, chest radiograph findings and increased white blood cell count, a diagnosis of pneumonia was made, and the patient was treated with empirical intravenous antibiotics (amoxicillin plus clavulanic acid and azithromycin), paracetamol and antihistamines. However, no improvement of the symptoms was achieved one week after admission. Fever, skin rash and raised inflammatory markers persisted despite the antibiotherapy. A blood analysis showed an increased level of leucocytes (15,400/ul) and an ESR of 120 mm/h. A peripheral blood smear was normal. Chest computed tomography (CT) revealed a bilateral small amount of fluid in the pleural cavities. Contrast-enhanced chest CT found no infective or inflammatory sign in the lungs. The patient underwent left-sided thoracocentesis with a pleural biopsy. The fluid showed features of inflammatory cells (predominance of neutrophils). Culture, direct bacterioscopy and genetic testing for tuberculosis were all negative. The activity of adenosine deaminase (ADA) in the pleural fluid was not elevated. Abdominal ultrasonography revealed mild splenomegaly, but abdominal CT showed no abnormalities. An electrocardiogram and an echocardiogram were normal. Mycoplasma, toxoplasmosis, human immunodeficiency virus (HIV), anti-streptolysin O (ASO), cytomegalovirus (CMV) and Epstein-Barr virus (EBV) serologies were all negative. His thyroid hormones and hepatitis markers were normal. He was also negative for rheumatoid factor (RF), antinuclear antibody (ANA), and antineutrophil cytoplasmic antibodies (ANCAs). Light microscopy of a skin specimen obtained from a red papule on the patient’s upper back showed dyskeratotic cells in the upper epidermis and inflammatory infiltrates with occasional neutrophils and rare eosinophils in the superficial dermis. A remarkably elevated level of serum ferritin (>40,000 ng/mL, reference range 21.8-274.6 ng/mL) was observed and a diagnosis of AOSD was made after a negative extensive infectious, neoplastic, and rheumatologic workup. The patient was initially treated with three courses of IV methylprednisolone pulse therapy (one course: 1000 mg/day methylprednisolone for 3 days), followed by prednisolone given orally at 80 mg/day (starting at a daily dose of 1 mg/kg). The patient’s fever and systemic symptoms promptly improved. However, the skin eruptions did not resolve until 2 weeks later, despite continuing steroid therapy. Therefore, methotrexate (20 mg/week) was added. Prednisolone was tapered to 20 mg/day 3 months later. The skin eruptions resolved with residual linear pigmentation approximately 1.5 months after onset (Fig. 2). AOSD is a rare systemic inflammatory disorder of unknown etiology that typically presents as a high, spiking fever accompanied by systemic symptoms.7 The diagnosis is made after the exclusion of infections, malignancies and other rheumatic or systemic diseases according to Yamaguchi’s criteria.8 The major criteria are fever of 39°C (one week or longer), arthralgia and/or arthritis (two weeks or longer), a typical rash, and leukocytosis, along with the minor criteria including sore throat, lymphadenopathy, splenomegaly, liver dysfunction, and negative ANA and RF serology. Very high serum ferritin levels have been observed in patients with active AOSD, and over 80% of patients present hyperferritinemia.9,10 In this case, our patient fulfilled Yamaguchi’s criteria for AOSD and also presented extremely elevated serum ferritin levels and pleuritis. For AOSD patients, nonsteroidal anti-inflammatory drugs (NSAIDs), steroids and methotrexate are the initial treatment for the disease; however, biologic agents may be used in the treatment for cases refractory to conventional therapy. Several recent reports have described the successful use of disease-modifying anti-rheumatic drugs (DMARDs) in AOSD.15,16 In the present study, we used methotrexate and prednisolone combination therapy, to which the patient responded well. In the initial stages of the disease, the diagnosis of AOSD is occasionally difficult due to the absence of specific clinical, serological and pathological findings. The skin lesions of AOSD are important for the correct diagnosis. Persistent pruritic, erythematous maculopapules and plaques may be an atypical initial presentation of AOSD; therefore, it is important to consider various cutaneous manifestations of AOSD for an early and correct diagnosis. 1. Bagnari V, Colina M, Ciancio G, Govoni M, Trotta F. Adult-onset Still’s disease. Rheumatol Int 2010 May;30(7):855-862. 2. Kaur S, Bambery P, Dhar S. Persistent dermal plaque lesions in adult onset Still’s disease. Dermatology 1994;188(3):241-242. 3. Lübbe J, Hofer M, Chavaz P, Saurat JH, Borradori L. Adult-onset Still’s disease with persistent plaques. Br J Dermatol 1999 Oct;141(4):710-713. 4. Thien Huong NT, Pitche P, Minh Hoa T, Laurent R. [Persistent pigmented plaques in adult-onset Still’s disease]. Ann Dermatol Venereol 2005 Aug-Sep;132(8-9 Pt 1):693-696. 5. Lee JY, Yang C-C, Hsu MM. Histopathology of persistent papules and plaques in adult-onset Still’s disease. J Am Acad Dermatol 2005 Jun;52(6):1003-1008. 6. Yamamoto T, Nishioka K. Flagellate erythema. Int J Dermatol 2006 May;45(5):627-631. 7. Fautrel B. Adult-onset Still disease. Best Pract Res Clin Rheumatol 2008 Oct;22(5):773-792. 8. Yamaguchi M, Ohta A, Tsunematsu T, Kasukawa R, Mizushima Y, Kashiwagi H, et al. Preliminary criteria for classification of adult Still’s disease. J Rheumatol 1992 Mar;19(3):424-430. 9. Akritidis N, Giannakakis Y, Sakkas L. Very high serum ferritin levels in adult-onset Still’s disease. Br J Rheumatol 1997 May;36(5):608-609. 10. Kong X-D, Xu D, Zhang W, Zhao Y, Zeng X, Zhang F. Clinical features and prognosis in adult-onset Still’s disease: a study of 104 cases. Clin Rheumatol 2010 Sep;29(9):1015-1019. 11. Yamamoto T. Cutaneous manifestations associated with adult-onset Still’s disease: important diagnostic values. Rheumatol Int 2012 Aug;32(8):2233-2237. 12. Wolgamot G, Yoo J, Hurst S, Gardner G, Olerud J, Argenyi Z. Unique histopathologic findings in a patient with adult-onset Still disease. Am J Dermatopathol 2007 Apr;29(2):194-196. 13. Fortna RR, Gudjonsson JE, Seidel G, Dicostanzo D, Jacobson M, Kopelman M, et al. Persistent pruritic papules and plaques: a characteristic histopathologic presentation seen in a subset of patients with adult-onset and juvenile Still’s disease. J Cutan Pathol 2010 Sep;37(9):932-937. 14. Suzuki K, Kimura Y, Aoki M, Takezaki S, Tuchida T, Takano T, et al. Persistent plaques and linear pigmentation in adult-onset Still’s disease. Dermatology 2001;202(4):333-335. 15. Pay S, Türkçapar N, Kalyoncu M, Simşek İ, Beyan E, Ertenli İ, et al; Ankara Rheumatology Study Group. A multicenter study of patients with adult-onset Still’s disease compared with systemic juvenile idiopathic arthritis. Clin Rheumatol 2006 Sep;25(5):639-644. 16. Ping Seung O, Sulaiman W. Adult-onset Still’s disease: A case report. Oman Med J 2011 Sep;26(5).